It may be useful for understanding conversations surrounding the stock market. For example, I've noticed that positive reports on consumer spending and employment tend to result in day-over-day market gains. Knowing that an increase in my portfolio's value is due partly to happy investor sentiment and general economic well-being, not necessarily to my genius, can keep me from being overly confident. But commentary disguised as news can lead me astray. For example, I've sold shares at what was touted as a good price only to see the price grow 50% in the subsequent 12 months. In addition, I've had to fight the desire to completely cash out after reading doom-and-gloom predictions; my energy should be spent devising strategies and taking firm actions, not fretting about the future. I think I could ignore daily stock market news and still invest wisely. But the word of wildly fluctuating markets tends to reach me, whether I search for updates or not. So, I've learned about the types of news, commentary, analysis, and data available to inform and influence me. These are the updates on market indicators, items that economists consider relevant to evaluating economic growth and influencing market movement. This type of news may include info on housing starts, inflation, unemployment, consumer spending, and consumer sentiment. These are the daily and during-the-day updates of various market indices (more casually, indexes) such as S&P 500, DJIA, etc. for the U.S. and global markets. I like knowing whether general market movement is affecting my stocks or whether specific company or industry activities are influencing their prices. Being able to see market indices tells me what is happening in the market at a glance. Company news covers earnings releases as well as happenings relevant to a company's financial position. Updates may include new product introductions, acquisitions, and share buy-backs. Many sites not only present company news but also provide tools to follow news associated with individual holdings usually via a watchlist or portfolio that I create. Having this capability is a valuable feature for accessing stock market news. Similar to the indices section in terms of raw data, stock activity displays the day's biggest gainers, losers, most active, etc. I find this data interesting: I may discover that a stock I thought no one tracked except me is heavily traded or I may learn about a little-known stock experiencing huge gains. Technically, personal finance and money topics aren't stock market news. But making smart money moves and growing your net worth aren't just about being a genius in the stock market. So I find general information, advice, and insights relating to personal finance to be useful alongside more newsy articles. What I don't find useful is distracting sponsored content and commentary presented as hard news. After reviewing several sites, Reuters emerged as my favorite place to get stock market news. It offers original news whereas some media outlets aggregate content from other sources including Reuters. You can find news on business and articles on personal finance topics as well as recent reports on earnings. Here are market indices' updates and headlines relating to economic indicators, business earnings and related activities on the home page and the Markets section. I can create a watchlist and check news on individual stocks (use the quote search). There aren't any traditional personal finance stories but rather updates on trendy topics. Visit MarketWatch to be treated to an overview of stock market news: market indices, S&P 500 movers, headlines of news relating to economic indicators and company earnings, etc. There's also a link to a watchlist tool, which I can use to customize my homepage. There are also sections devoted to personal finance and retirement. Morningstar covers stock market news as well as news relating to ETFs and mutual funds. It has the latest on market news (both economic indicators and company-specific information), market indices, and stock activity. The personal finance area defaults to a retirement category but includes sections covering college savings, taxes, and more. There's solid news here but many of the articles are opinion synced with Morningstar's investing philosophy and some content is accessible through a paid subscription only. Here I can see what's happening in market indices (with NASDAQ first) and stock market activity on the home page along with news and analysis. To learn about general economic news, I'll visit the Economic Calendar and click on indicators that intrigue me the most, such as the State Street Investor Confidence Index. To get news on specific companies, I'll enter stock symbols here. I can also read personal finance articles sourced from outside media outlets. Investing.com has a lot of good information, though the site is cluttered and overstuffed with ads. If patient and persistent, I'll find the usual info on market indices, market movers, and economic calendars on the home page and news about the U.S. and global economies via stock market news (which includes articles from Reuters), economic indicators and various global economies. Yahoo! Finance aggregates news from many sources but also offers original news and commentary. Watch out for sponsored content, which is mixed with sourced articles. Still, there's a wealth of company, economic, and market news in the Business & Finance section; articles on retirement, credit and debt, careers, and more in the Personal Finance area; and statistics in Market Data. I can set up a portfolio with a Yahoo! account or add stock symbols in the box at the top left to get quotes. Follow the symbols to discover loads of financial statistics and commentary on a specific company, similar to the type of information found at my brokerage firm for detailed stock analysis. This capability is one of the features I love best about Yahoo! Finance. Stock market news is available through local newspapers, national news websites, and sites dedicated to providing commentary and recommendations on various publicly-held stocks. Though I've consumed information from these places, I prefer sources that report news without an emphasis on convincing me to buy (or sell) a certain stock, warning me about impending economic doom, and reporting of market movements described in superlatives like plunge or skyrocket. Getting more news and less opinion can be useful in understanding what's really happening in the stock market and whether it's a usual or unusual reaction to world economic events. 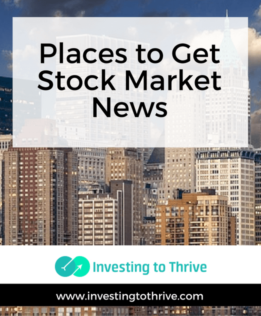 What's your favorite place to get stock market news?